Oluwaseun Fakunle goes into this weekend’s Nigeria Women Premier League week 6 game in fine form and high spirit. 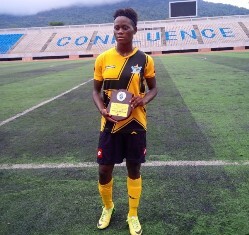 The Delta Queens forward was named Futbalgalore.com’s Player of the Month for May, and received her award on Monday. Presenting the award at the Lokoja Confluence Stadium, Chairman of Kogi United and Confluence Queens Mallam Abdul Sule, commended Fakunle for her efforts in emerging as the player of the month of May. The former Super Eagles star praised the organisers for their initiative in encouraging budding talents in the land. In the month in review, Fakunle was an influential figure during Delta Queens strong start to the season, featuring in 3 Premier League games, including two wins and one draw. She netted two goals, as well as providing two assists. “I didn’t expect to be nominated for the award,” Fakunle told newsmen shortly after the game between Confluence Queens and Delta Queens. “My appreciation goes to the organisers of the Award, Chairman of Confluence Queens, the management of Delta Queens, my coaches, team mates and football fans,” she added. Delta Queens are currently second in the Group B of the league table ahead of Saturday’s week six encounter against Sunshine Queens.